Hi everyone! I’m super excited to unveil “Instinct”, the newest Picture Polish Collaboration Shade! 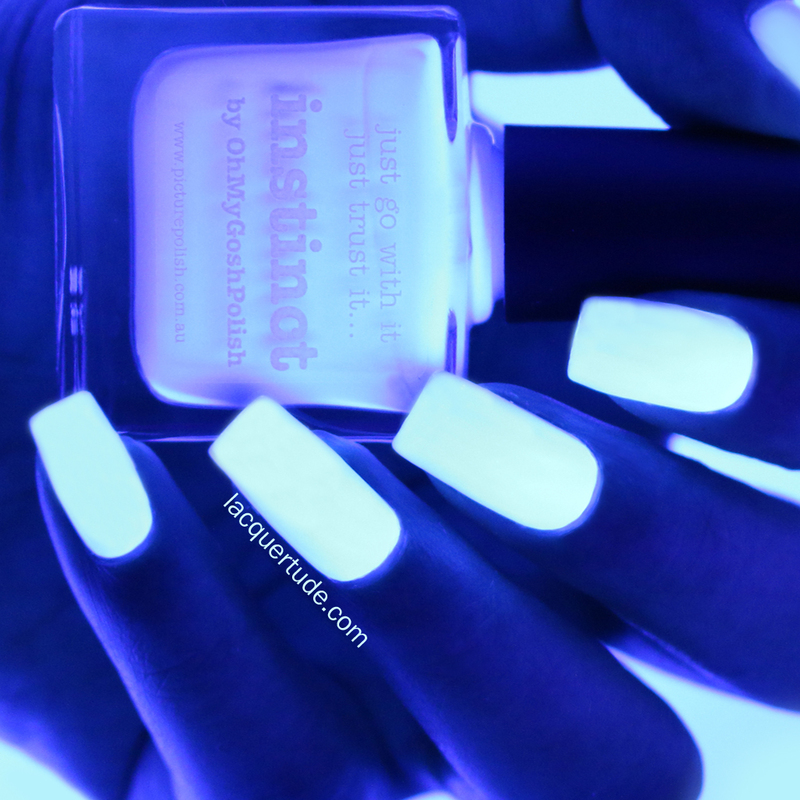 This is one glamorous, fun, and in your face glowy polish *under black light! Since it’s my first time swatching and photographing this type of polish, I made a special collage to show off the polish under normal and black lighting. I think it’s pretty cool…what do you think? Alright, now onto the swatches! 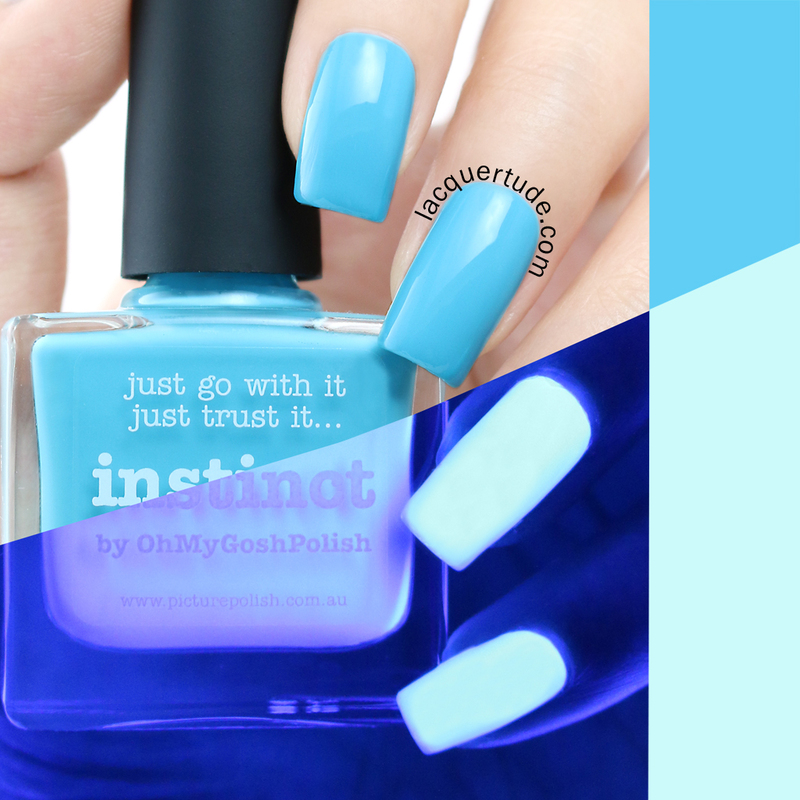 Instinct in normal lighting is a gorgeous vibrant robins egg blue creme with a smooth 2 coat formula. In my opinion, even if you’re not particularly into glow in the dark polishes, you’d enjoy it as a stunning blue shade. Picture Polish have done many different kinds of blues before, but I love the aqua twist to this shade of blue! BAM! Now look at the GLOW!!! It’s really amazeballs, and let me say it was NOT shy at all in showing off its unequivocal luminescence! This shade was made in collaboration with Tam from @ohmygoshpolish on Instagram. She’s an amazingly talented nail artist, a super fun “Chicky” (borrowing Tam’s favorite nick name for us polish lovers), and the-QUEEN-of-GLOW-In-The-Dark! I am honored to have been one of the first to review her creation. Definitely check out her photos since she’s much more experienced at photographing GITD polishes. Instinct will be released along with the Rocky Horror Polish Collection and the new Urban Shades collection on the Picture Polish website on Monday 14th April at 9:00am Brisbane, Australia time. For most of us on this side of the world, it’ll be sometime on Sundy, April 13th, so be sure to check your time zone conversion! International ladies should check out the Picture Polish Network stockists for their launch time/date. What do you think? I’d love to hear your feedback since it’s my first time photographing a glow in the dark polish. Was it clear? Did you like the split screen collage at the beginning that showed how the polish looks in both lighting conditions in one picture? 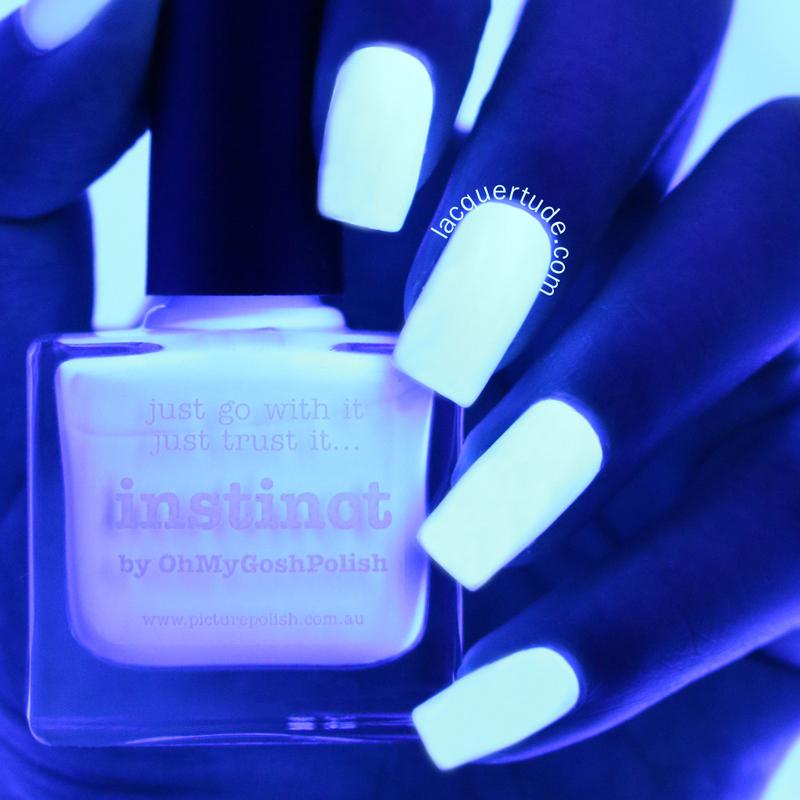 *I got confirmation from Picture Polish that this shade glows under black light, and not glow in the dark. Hopefully that’s helpful for you in making decisions. To me, it doesn’t take away from the beauty one bit! Outside of the creep factor GITD nails have for me, this is a great posting, terrific photos and layout. The actual polish, though, is such a fantastic color – love it! Wish I had a never-ending secret stash of money to buy All the Picture Polish! Hi Lara, I’m not sure if you’ll read this comment, but I got confirmation from Picture Polish that this shade only glows under black light and does not glow on its own in the dark. Hopefully that makes purchasing it a bit easier? LOL! You have very beautiful nails. Color is very beautiful! Does it truly glow in the dark or just under blacklight? It’s such a gorgeous colour! Until I saw your swatch for this one I thought I could definitely live without it but now…. I never tried a glow in the dark polish and I’m not sure about it ( I am sure though, that my 8 year old daughter would looooove that idea ). But this blue, omg it’s a gorgeous shade ! I think I need that shade of blue. There is something so calming about it, it just makes me feel good when I look at it. Thanks again for your amazing job !